Tweeter Account was locked due to a complaints by someone? 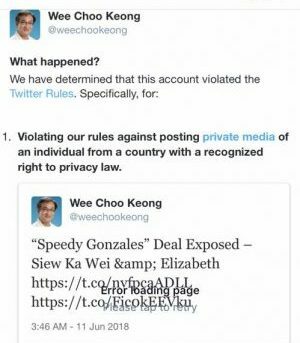 Apparently, some of the content that was featured in my expose of the “Speedy Gonzales” deal falls foul of Twitter’s privacy policies. Yours truly wonders how their attention was drawn to this alleged infraction in the first place? Is it possible that someone complained? Someones must be on heat because of the several postings in connection with the “Speedy Gonzales” RM99.693 millions contract involving Geeko Tech Sdn Bhd , HERE, HERE, HERE. As you can see from the post in question, HERE, yours truly had not used any private or confidential material to make the case – any pictures and screenshots of profiles are in public domain and accessible to anyone with a Facebook or Linkedin account. So regardless of whether it’s Twitter’s privacy policies or Malaysia’s Personal Data Protection (PDPA) regulations, yours truly is confident that yours truly did not overstep the boundaries. Yours truly has appealed to Twitter to unlock yours truly’s account on these grounds and yours truly hopes to be back online soon. Yes both of them were definitely on heat. Don’t upload the pictures in the Facebook or other info in Linkedin if you don’t want people to see. What is so private about their relationship when the whole advertising industry knew about it. It is an open secret la. I thought that his skin is thicker than the skin of the elephant. Now he is embarrassed by the facts. just too bad Mr Macho man. Facts the hard facts. You cannot run away from it. You will have to answer to the MACC soon about the dirty deal. If one wants to know why Siew-er Ka Wei will survive MACC, look closely at the relationship between a Mohd Azar Bin Ismail for Titanium-Redberry-Ancom group and MACC new boss. You then will understand why the crusade again Siew-er Ka Wei is dead. Even the 30,000 Lenovo computers stored at Ancom office that Ministry of Education was supposed to buy at inflated price from Utusan, another Siew-er Ka Wei partner, is not going to be enough. Nice try. He can try to stop YB’s twitter account but everybody know about his nonsense in the corporate world. This Geeko’s deal is crystal clear. We also know that Geeko’s deal is a special purpose vehicle for him and the little napoleon. Everybody in the advertising world and his friends except his stupid wife know that Elizabeth is his playmate. So why want to stop the people from knowing. Now the world know that Elizabeth is the CEO of Geeko and she is also the media specialist of Redberry. So Siew Ka Wei what else you want to lie? You want us to believe that you don’t know her or you only know her in the room? Then the Sewerage can do another Geeko’s deal with impunity. No wonder MACC is moving with a slow pace. But MACC had already raided and taken copies of documents from Tourism Malaysia. The Sewerage man can now give out the Lenovo computers as charity drive for his Genovasi University and other schools. Then can inflate the price and bill to his many outfits. He is a wheeler, dealer and screwer. Noe he could no longer be a bullshitter because Najib is out. Thank God for that.